We do get asked a lot what some of the ‘jargon’ is that is listed either in the brochures or our website. So we’ve compiled a list of ‘Jargon Busters’ to help everyone! A motorcaravan that has a purpose built body on a chassis. The living area and the cab are made by the factory. Automatic energy selection. This is a feature of many fridges, that enables them to automatically switch between 12V, 240V and gas power sources. A chassis extension used to improve handling and lower floor height. Double-floor Alko chassis are used to provide underfloor storage. The number of sleeping areas provided by a motorhome. This is not always the same as the number of seats. Often used as driver’s seats, these are comfortable, stand-alone seats that have a swivel base, arm rests and are easily adjusted. Alternative name for a coachbuilt camper (see below). Toilets featuring a holding tank accessed via a hatch on the outside of the vehicle. Waste can be disposed of by removing a slide-out cassette. Sites approved by the Caravan Club – sometimes known as CL sites. As above but run by the Camping and Caravanning Club. Bottles of chemicals are used to keep the toilet fresh. A motorcaravan that has a body built on an chassis that retains the chassis manufacturers existing cab. A fuel injection system used on the latest turbo-diesel engines. These are claimed to increase fuel economy. The cost of bringing a motorcaravan from the factory to the dealership, which is passed on to the customer. A popular style for motorhome seating, a dinette features a table between two bench seats. This layout can often be converted to form a bed. Earth Leakage Contact Breaker – also known as an RCD or Residual Current Device. A price that excludes on-the-road costs such as road fund licence, delivery charge and number plates. A device used on gas appliances to stop gas escaping into a vehicle if the flame goes out. The maximum permitted loaded weight of a vehicle. It is an offence to take a vehicle onto a public highway that has a total weight in excess of its GVW. Heavy Goods Vehicle. This term is now being replaced with LGV, meaning Large Goods Vehicle. A term used to describe items found inside a motorhome, ie watertanks. 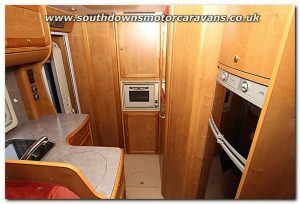 The sleeping, eating and seating area of a motorcaravan, not including the cab. 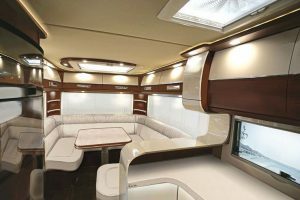 A coachbuilt motorhome with no sleeping area over the cab. The more streamlined shape is designed to improve aerodynamics and fuel economy. Liquid Petroleum Gas – a green fuel alternative that can be used to power petrol vehicles and which is available at many UK petrol stations. If you own a large motorhome, this could be a way to cut your fuel bills. An overcab area usually featuring an integral sleeping compartment. Available on campsites to allow motorhomes to connect to a 240V electricity supply. A new term now used to describe Gross Vehicle Weight (see definition above). It means exactly the same thing but is considered less open to misinterpretation. Mass of the caravan equipped to the manufacturer’s standard specification stated on the caravan weight plate. This now includes those items required for the safe and proper functioning of the caravan (e.g. gas cylinder, fresh water and hook up cable). Note: Dealer fitted items must be taken into consideration if it is a dealer special. Items made available by the manufacturer or dealer over an above the standard specification of the caravan e.g. spare wheel, air conditioning, motor mover, awning etc. Payload is used by motorhome manufacturers to indicate how much a vehicle can carry. It is the difference between the Vehicle Unladen Weight (VUW) and the Gross Vehicle Weight (GVW) or Maximum Authorised Mass (MAM). Those items which you choose to carry in a caravan which are not included as essential habitation equipment (e.g. clothes, crockery, cooking utensils, bedding, TV, radio, footwear, books, awning and food). Often used in discussions of payload. Pre-delivery inspection carried out by a dealer prior to delivery. Panels built around the lower edge of a motorcaravan which are often knock-resistant and may house storage lockers. Statutory off Road Notification (SORN) applies to any vehicle taxed on or after 31 January 1998. A declaration must be made by the vehicle’s keeper whenever the licence is not renewed or is surrendered for refund. Keepers acquiring untaxed vehicles must license them or declare SORN if they are kept ‘off road’. If your vehicle was not taxed on 31 January 1998 (ie classic cars, vehicles stored away for restoration, etc), you do not need to take any action until it is next taxed. Payload relates to the weights of all items carried in a caravan and is the allowance you have for: Optional equipment, Personal effects. The total allowances represents the difference between the MTPLM and the MRO. Vehicle Unladen Weight (VUM) normally means the empty weight as a motorcaravan left the factory, ie without water, fuel, gas bottles or persons on board. Your ’empty’ vehicle is likely to weigh more. Offered by manufacturers and dealers to cover certain items against defects for a set period of time. Look for a warranty that covers the base unit and the living area of the motorcaravan for up to three years. We hope the list helps! But if we’ve missed something, let us know in the comments. NEW Accessories Shop Website – Now Live! We have exciting news, our Accessories Shop website has been launched to the public. Head over there now to check out our extensive range of accessories – TV’s, Awnings, Sanitation, Furniture and Gas and much much more. The Shop is situated at our showroom building Painter Close, Anchorage Park, Portsmouth, Hampshire, PO3 5UH. Author Blog AuthorPosted on 26th March 2019 2nd April 2019 Tags ShopLeave a comment on NEW Accessories Shop Website – Now Live! 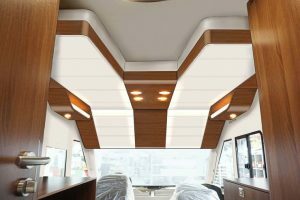 British manufacturer Bailey will release its new Advance motorhome range at the Camping & Caravan Show at the NEC in Birmingham, which runs from the 20th to 25th of February 2018. They are releasing 6 new Coachbuilt models which they hope, will rival Elddis Autoquest & the Swift Escape. With their high level of specification, which is a massive turn-around from previously launched models, so much so that they have limited their ‘optional extras’ to bespoke bedding that will complement the interior and soft furnishings. The 66-2, is a 2 berth with a generous front lounge. The 76-2, is a 2 berth with a gorgeous rear french bed, and the sister model, the 76-4, is a 4 berth also with a rear french bed. 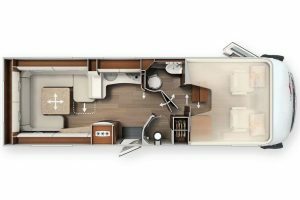 The 74-2, is also a 2 berth with a rear transverse island bed, the sister model 76-4 is a 4 berth with a rear transverse island bed. And finally, the 70-6 is their 6 berth that offers a large rear lounge and a drop down double bed over the dinette. While the lounge area hides an additional double bed conversion. The new models look to be turning 2017 upside down with their new offerings. After much speculation, Carthago has announced a new 2 berth liner for 2. Despite this generous space, the Liner for Two comes with an impressive outside length of 7.80 meters. With a rear garage, which should be sufficient for two bicycles, provides ample storage for the on-the-go motohome enthusiast. Typical for Carthago this motorhome comes with raised flooring and offers considerable additional storage capacity and ensures high winter suitability thanks to frost-protected water tanks. Although the new integrated is technically based on the Chic E-Line, Carthago positions it as an independent series. There is further speculation that other models similar to come to market. The pricing of this model is still not available. Stay tuned for more information on the new Carthago model! After almost 10 years as our Financial Controller, we are saying ‘Happy Retirement’ to our Jeanette. Having joined us in 2008 from a similar motor trade, Southdowns snapped up the chance for Jeanette to come work for Southdowns. After retirement Jeanette and her husband John are planning a cruise through the Virgin Islands. It was a teary eyed morning, but onward and upwards. 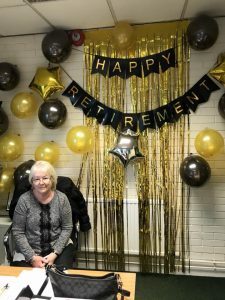 We wish Jeanette the best of luck for the future and hope she enjoys every minute of her retirement. Author Blog AuthorPosted on 8th November 2017 Format ImageLeave a comment on Good Luck Jeanette! This month our Sales Manager, Ben Tosspell, hands down says that our Rapido 9048DF is our motorhome of the month for October. RAPIDO was born from the creative mind of Constant ROUSSEAU in 1961. While not typically a brand that Southdowns sells as a new offering or factory order, we are always so surprised at how quick our Rapido part-exchanges are sold! The Rapido is 4 berth, 6.6metres long with a drop down double bed over cab and a spacious rear kitchen. It hold’s its own with a 6-Speed Manual Gearbox. And with only 30,684 miles is a bargain! The Chassis Plated at 3500kg GVW, is Right hand drive and has Cab air conditioning, Central locking, Electric mirrors, Driver airbag, Pioneer Radio/CD and Rear camera. Cab blinds. Drop down double bed over cab with roof light, security net and privacy curtains. 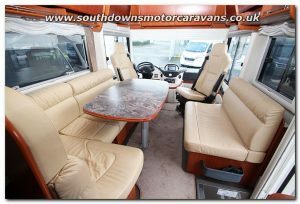 Large lounge comprising L-Shape sofa, side sofa, swivel front cab seats, Fabric upholstery, Drop down dining table with folding leaf, overhead storage cabinets, TV cabinet with slide out mounting bracket and roof light. Truma gas and electric blown air heating. Rear L-Shape kitchen with 3 burner gas hob with hinged glass cover, stainless steel sink, extractor fan and overhead storage cabinets. Dometic fridge with separate freezer compartment. Rear cupboards with built in Smev oven and grill. Large wardrobe. Rear washroom Thetford cassette toilet, stainless steel washbasin, vanity unit and separate shower cubical. Flyscreen, BBQ point, Roof bars, Road Pro Satellite dish, PWS Tow bar and electrics, Fiamma 4m Awning and electric step. 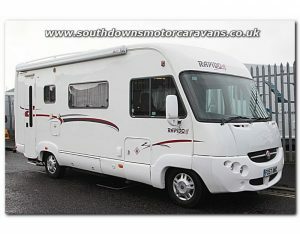 To get more information on this motorhome and view our range of pictures, follow the link below. Black Horse, part of the Lloyd’s Bank Group, is one of the UK’s leading vehicle finance providers. 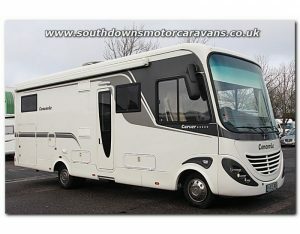 They have close relationship with many dealers including Southdowns Motorhome Centre; they can offer excellent customer service and personalised finance otions including Hire Purchase and Motorhome PCP on selected new motorhomes. Finance your next motorhome or holiday home by spreading the cost with fixed regular monthly repayments, after which you own it outright. Black Horse Hire Purchase could help you buy your dream motorhome while spreading the cost. Agree an initial deposit, the agreement term and monthly repayment amount with the dealer, who will submit the finance application to us. Subject to your application being approved, you can just drive it away – and after you’ve made all the repayments including the interest, the motorhome is all yours. Keep your monthly payments low by deferring a large proportion of credit. Enjoy flexibility at the end of your agreement and the reassurance of a Guaranteed Future Value (GFV). Our PCP product is a great flexible payment option. With Black Horse PCP you can choose how much deposit you’d like to pay, the contract term and final payment. It’s ideal for those who want to keep their options open – at the end of the agreement you can choose to buy the motorhome, part exchange it for another or simply hand it back. Pay the Final Repayment to own the motorhome. Find out more about Black Horse finance products in their product guide eBook. Download e-book. Calor Gas announced back in May that the 6kg Lite Cylinder would be phased out due to on-going issues. 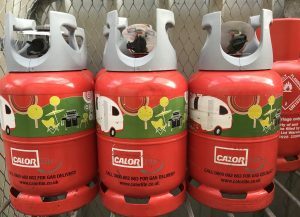 To reassure caravaners as well as the motorhome community, Calor has said all existing 6kg Calor Lite customers will be able to swap to the new cylinder when it is launched, free of charge. “Back in May, we announced plans to change our 6kg Lite cylinder, as we have concerns about the longevity of the current model, with a higher number than expected failing our routine quality inspections. As a result, it is impractical to invest in any further stocks of a product we intend to change, so we have increased the volumes of standard 6kg cylinders available to the market and put in place a customer exchange programme. The £1 million pound investment is to help increase the volumes of their standard 6kg currently available in the UK market. This is the largest investment in the 6kg cylinder in recent years. TyreSafe is the UK’s charity dedicated to raising awareness of the importance of correct tyre maintenance and the dangers of defective and illegal tyres. This is across all motor vehicles including motorhomes. One of the key reasons TyreSafe was formed was to help reduce the amount of tyre related incidents throughout Britain by promoting awareness about proper tyre maintenance and the dangers associated with having bad tyres. Since its inception in 2006, they’ve helped reduce the amount of people killed or seriously injured by 44%. “Whatever tyres are fitted to your motorhome, it is essential to the safety and stability of the combination that all tyres are correctly inflated for the applied load. Tyres that are under-inflated are much more likely to suffer from a sudden rapid deflation which can cause loss of control of the vehicle”. With so much pressure on the Motorhome Industry to help customers, Tyre Safe have now created an online motorhome tyre pressure calculator. You just need to enter a few details and you will be told the suggested tyre pressures. This month our Sales Manager Ben Tosspell has chosen our Used Left Hand Drive, Concorde Carver 821 L as our Motorhome of the Month! For years, Concorde Reisemobile has been the epitome of luxury motorhomes for UK and Europe. The Concorde Carver reprises fantastic value for money, compared to the new model valued at over £250,000. There has only been 1 of these, with this specification sold in the UK. When you look at the specification that is included, you would have to agree it is a choice motor. 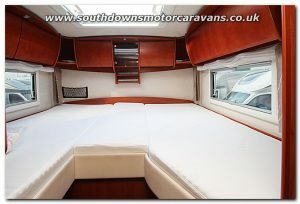 A 2 berth 8.28metres long A class with rear twin single beds over the garage and wrap-around cupboards over the cab. With an impressive engine boasting 3,000cc and 170ps, you won’t be lacking any pull. Based on the current mileage of 30,000 miles, there is still plenty of life left in this motor and ready to go on its next adventure. With the Concorde C- lounge, you get twin swivel front cab seats, L-shaped couch with side couch and beautiful leather upholstery in Sandstone. The lounge also has a central table, LED flatscreen TV, overhead storage cabinets, removable carpet in grey/brown and a Panoramic skylight. The bedroom compromises of 2 twin beds at the rear of the motorhome, above the garage. It has impressive windows in the bed area, allowing for more air and sunlight to make its way in. The overhead storage above the beds is perfect for two people. Stop by and see us or give us a call to get more information on this Concorde. More information is here on our website, with a lot of additional pictures. Of course, the pictures will never do this beauty any justice so you will have to come see it yourself!